Green smoothies have changed my life. 7 years on and I’m still drinking 1-2 complete meal green smoothies per day. (aka Green Thickies). The benefits of green smoothies can’t be brushed under the carpet anymore. It’s time for the world to wake up and take notice. 1) Weight loss. Increasing the number of fruit and vegetables you eat in a day gives you body an opportunity to shed excess fat and water weight built up from toxins stored in the body. I lost 56 pounds by drinking a green smoothies. 2) Muscle Gain. Popeye had it right. Leafy greens do actually contain a lot of protein which helps to build muscle. But that’s not all. They also contain an abundance of other nutrients which are also needed to help build a strong, healthy body. Just look at all the vegan bodybuilders and professional athletes we now have. They know the value of including leafy greens in their diets and their results prove that leafy greens are working incredibly well for them. 3) More energy. If you start the day with a green smoothie you will notice a massive increase in the amount of energy you have. The main reason I’m so passionate about green smoothies is that I recovered from chronic fatigue syndrome on a green smoothie diet! You can read my story here. 4) Mental clarity: Junk food, especially processed white flour and sugar can clog our minds making our brains feel cloudy. Drinking green smoothies will clear your mind and free up your creativity so you can think more easily. Our brains are supposed to slow down as we age but I swear mine is speeding up. I feel sharper, and more on the ball than I’ve ever felt in my life. 5) Crave less junk: When you increase the amount of healthy foods in your diet and decrease the unhealthy foods you will naturally stop craving junk food and crave more of the same healthy food. You may find yourself adding more fruit during the day when you start eating more healthily. 6) Less snacking: A filling green smoothie (green thickie) normally contains the right amount of calories for one healthy meal. And because the ingredients are generally low GI, they will keep your blood sugar levels low until lunch time helping you to cut out snacking altogether. Since I started drinking complete meal green smoothies – I never feel the need to snack now which really helps me lose weight faster. 7) Improves skin. 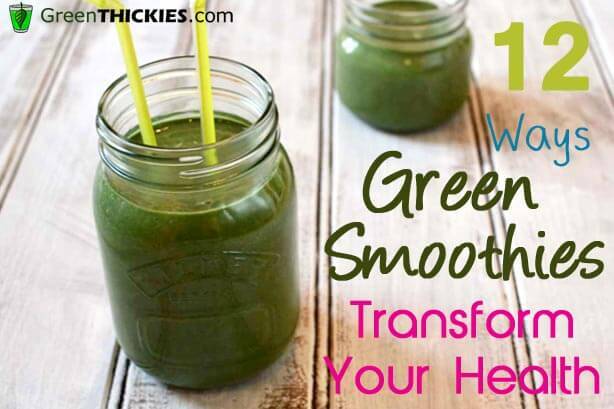 The amount of acne may reduce when you improve your diet by drinking more green smoothies. It worked for me. I used to have awful acne covering my whole face and now I very rarely get any spots. Give it a try for 7 days and see for yourself? 8) Lessens wrinkles: The increased fluids and power of natural foods in your diet will hydrate your skin and reduce your wrinkles making you look younger. Can you believe that since I started drinking green smoothies 10 years ago, people guess my age at more than 10 years younger than I actually am! This alone is one good reason for carrying on with my daily green smoothie habit for the rest of my life! Also whole plant based diets have been scientifically shown to reverse cellular ageing. Yes your whole body will actually get younger! 9) Reduce the risk of serious diseases: It is well known that one way of preventing cancer and heart disease is to increase the number of fruit and vegetables in your diet. The more green smoothies you drink, the lower your risk. Plant based diet in general have been proven to eliminate or significantly reduce the leading 13 causes of death. 10) Improve your immunity to colds, flu and other bugs and feel generally amazing. After having a cold or the flu all winter long, I didn’t have a single bug for 3 years after introducing green smoothies to my diet. 11) Improve your digestion, detox and get your health off to a flying start today. My IBS totally cleared up after changing my diet. A green smoothie will be guaranteed to get everything moving in the morning. 12) Reduce other health complaints: Whatever health complaint you are suffering from, diet can have a dramatic effect on the severity of your symptoms. Try one green smoothie a day for the next week and notice the difference in your own health. 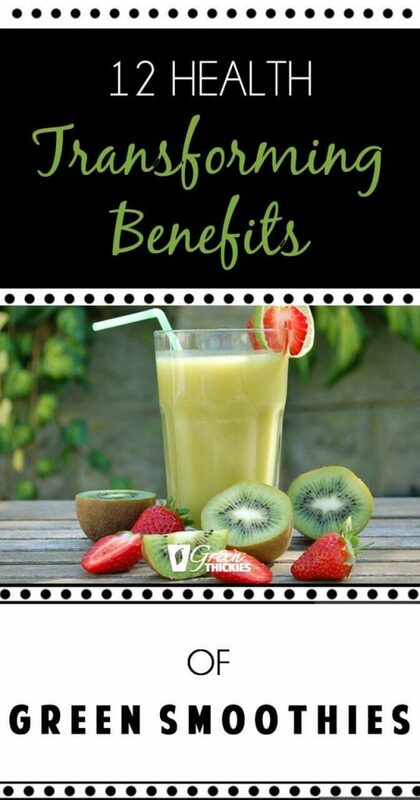 I’d love to hear about the benefits of green smoothies in your life. 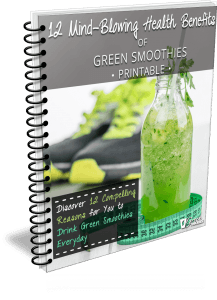 If you would like to know more about how to start introducing green smoothies into your diet, sign up for my free 12 week e-course. My course will help you lose weight and improve your health starting TODAY! Sign up for my FREE 12-week e-course here. If you enjoyed this post please click the + symbol at the bottom of this box, thank you! 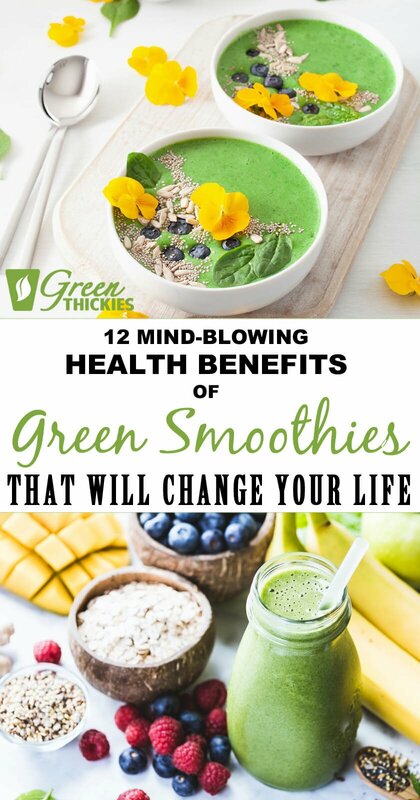 Hi Just read your article and its awesome… I have been on green smoothies since yesterday and I am doing it mainly to get more energy and to have clear beautiful glowing skin. Just one question.. In how much time did you see results in your skin?. Thank you for sharing and keep up the good work. Hi Jasmin. I’m so glad you are enjoying green smoothies. They are amazing for all aspects of your health. I used to have really bad acne before I changed my diet. I can’t remember exactly how long it was before I saw a big improvement in my skin. I think it might have actually been a few months because I went through such an intensive detox and you can actually get more spots when you’re detoxing as the toxins come out through your skin. Stick with it and I’m sure you’ll see results eventually. Hi Thank you for your comment and yes you are right I am actually having more spots after I started it and today is Day 9 but the rest of the skin has improved and I see improvement in overall complexion hopefully within a few weeks I will see the results and my body will be toxin free. Thank you for the motivation and keep up the good work. Hi, I’ve been making green smoothies for about a week now and I was wondering did you only drink them for breakfast and you lost weight? Or did you drink more a day. I’ve been drinking one a day as a breakfast replacement. Do you have any other weight loss tips? Hi Gabby. I started off just drinking them for breakfast but when I replaced my lunch with them too my weight loss did speed up. My weight loss tips would be just to eat a whole foods diet as the body will know when it’s had enough. I’m bringing out a 7 day diet plan soon that will help people lose weight, so stay tuned for that! I’ve recently started juicing and it works great with regular fruits and vegetables. Especially the ones that have alot of “juice” in them. However I have found that when throwing leafy greens in them, alot of times half or whole the leaf gets catapulted straight into the collector bin. I think Summerortiz makes a good case. I’ll see about getting a blender as well and combining them. Also the idea of throwing sprouts in sounds great. What’s with the spirulina though ? Is there any real benefit to that ? I read that it possible contains b12. Could you elaborate a bit on that? Thank you for your article. I used your information to get started on green smoothies when I first got my Vitamix. I just put my personal recipe on my blog and linked your site to it. I think you have done an outstanding job of answering common questions. Hi, I have been using my Vitamix for 3 months and having green smoothies each day for breakfast, sometimes for dinner, a green salad each day for lunch. On the weekends, I eat regular food, but still have the smoothie for breakfast. I am GAINING weight. I work out. What’s up with that? I am very discouraged. I feel great and I can tell my skin is better, which is a big plus, but the weight!!! Can you suggest anything? Thank you for your article. Very helpful and healthy tips too. Keep posting. Smoothies are good and healthy. the blogger lovers but this piece of writing is truly a pleasant post, keep it up. I just have one question: How about the taste? Is it bearable? 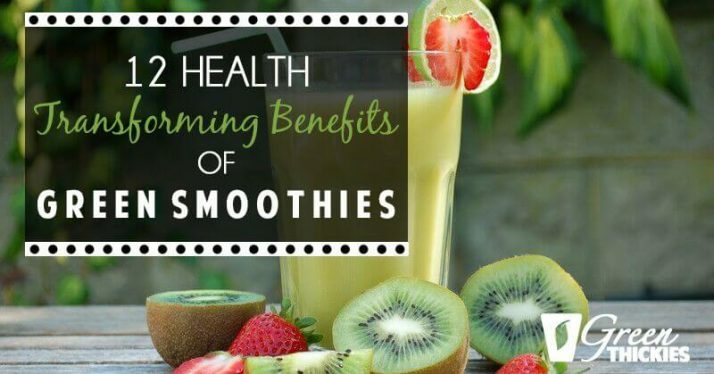 These smoothies can really have a huge benefits on people’s health. I had no idea that it had this many benefits though, this is 12 great benefits! It is pretty amazing that it can help weight loss and weight gain.